This product is awesome! Especially for the guys in my home who shave. They've been telling me how much it really is useful. They love the shelf so that their razors are always there and of course they love that it's fogless & stays put. I like to brush my teeth in the shower and ToiletTree ~ Fogless Shower Mirror is nice to have for that. I have always done it without a mirror, but it's just nice. This really is a quality, useful product. We all like it! *Follow me @jamaise at Twitter & Tweet this : RT @jamaise #GIVEAWAY #WIN - a Really Nice Fogless Shower Mirror from ToiletTree http://bit.ly/bUpBkt Ends 8/13 tweet each day for one entry each ! *Enter my Sport Brella GIVEAWAY!!! Disclaimer: ToiletTree provided me with a free sample of this product to review, and I was under no obligation to review it if I so chose. Nor was I under any obligation to write a positive review or sponsor a product giveaway in return for the free product. These views are my own. I would love this for my husband who is always complaining in the shower when he shaves! I'd get this for my husband so he can shave in the shower. follow u and I'd love this for my hubby - who never spoils himself! My hubby always shaves while in the shower. It would be much easier if he could actually see what he was doing. I'd win it for my son. He always shave's in the steamed up bathroom and it's hard to see, so this would be great. This would be for my son. His fogless mirror keeps fogging up. I would like to win this for my son because he is one of those guys who like little to know hair on his body....muscle definition. I Like ToiletTree Products at Facebook. I Entered your 6 - PIECE AMENITY SET from Simply Organic GIVEAWAY!!! I follow on GFC. My man would love this mirror. He shaves after showering & it certainly is all fogged up in the bathroom. I would like this for my husband because he shaves his head as well as his face. I follow your blog and this would be great for my husband so he could see to shave in the shower. Thanks. I entered the Adrienne Audrey giveaway. I entered the Aurora Gifts giveaway. I entered the MJ's Herbals giveaway. 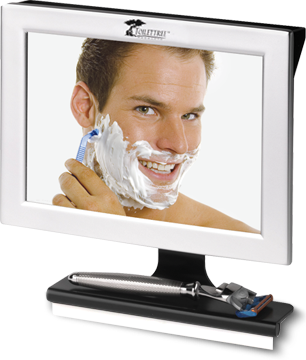 I think it would be very convenient for my husband to be able to shave while in the shower with having this mirror.